SLXi-DRC: CP and Thermo King collaborated on a four-month field test to verify its performance. Thermo King’s SLXi Domestic Reefer Container (DRC) unit offers additional space for cargo. New reefer container significantly reduces the global warming potential. 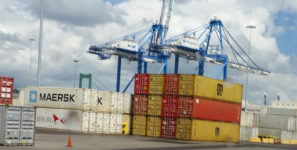 CP installed reefer unit on a six-year-old container and tested performance on a variety of loads. Thermo King, a provider of transport temperature control solutions, has announced that Canadian Pacific Railway Limited (CP) has selected its SLXi-DRC units to fulfill its largest, single domestic reefer container (DRC) order in Canadian history. CP is the first Thermo King customer to purchase the SLXi-DRC unit in North America. The SLXi-DRC units have a slim profile, which increases cargo capacity by providing room for an extra pallet row of cargo space in the container. The SLXi-DRC also uses next-generation, lower global warming potential (GWP) refrigerant, R-452A, helping companies like CP and Thermo King meet sustainability goals. CP and Thermo King collaborated on an extensive, four-month field test of the new SLXi-DRC unit to verify performance of the technology in the rugged environment and climate of Canadian’s railways. Thermo King was the first transport refrigeration business to offer next generation refrigerants in its North America products. Understanding that customers operate in highly regulated spaces, it is the business’s mission to understand and address current and future regulatory requirements.